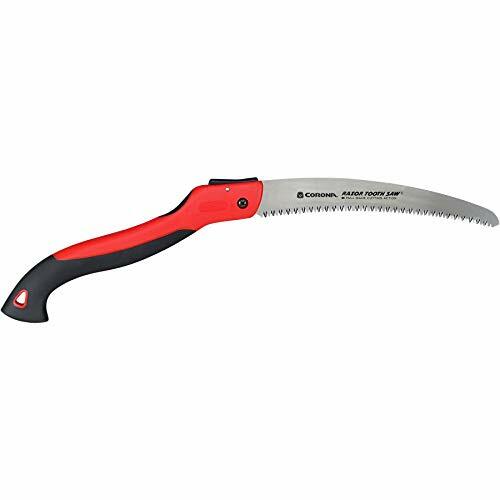 Best Pruning Saw: Make Quick Work of Your Bushes and Branches! After an exhaustive look at several pruning saws available on the market, we’ve found that the best pruning saw is the TABOR TOOLS TTS13 Pruning Saw. It is not a fancy saw. It doesn’t fold, it doesn’t have pretty decorations on the blade. But it cuts like a beast. It cuts on the pull, giving good options for putting some power into the cut. The sturdy blade is resistant to breakage, and users universally have given this a thumbs up. It is rated for medium to large limbs and can easily be used on hardwoods such as oak. Its only drawback is that if you want a sheath for it, you must purchase the sheath separately. This is an added expense, but if you plan to backpack or camp with this tool, you will probably want it. 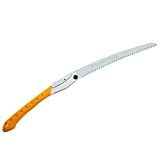 TABOR TOOLS TTS13 Pruning Saw, 13" Curved Steel Turbo-Cut Blade, Suitable for Trimming Tree Branches & Clearing Forest Trails. For further details on the Tabor Tools TTS13, see the Product Reviews section below. When it comes to hand tools for lawn care, it is hard to beat Fiskars. The Fiskars 393951-1001 Extendable Pole Saw & Pruner is no exception. It is two tools in one. The saw end can be used to cut tree limbs, hard-to-reach shrubs, and even to saw up downed limbs. The twig cutter can be hooked over a branch and the lever pulled using the attached cord. While not as heavy-duty as the Tabor pruning saw, it is exactly what is needed for those hard-to-reach twigs and small branches. You can even use it as a regular pruning saw by collapsing the telescoping pole and choking up on the handle. In some ways, it could almost be a budget pick tool because you are getting two tools in one. However, it does have the drawback of not being all that great for close work. Even so, it lives up to Fiskars’ reputation for excellence, and it a great pruning item to have in your tool repertoire. For more information on the Fiskars Extendable Pole Saw and Pruner, see the Product Reviews section. 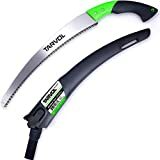 The Tarvol Heavy Duty Pruning Saw is a good choice for the budget conscious gardener or camper. It is a little light-weight for continual use but is perfect for the gardener who just needs a saw once or twice a year or the backpacking camper who needs an easy way to cut branches for a springy camp bed or for a campfire. The pulldown cutting action makes it easy to trim lower limbs or quickly cut through fallen limbs. Not as sturdy as the Tabor or as versatile as the Fiskars, it is nonetheless a handy little saw to have in your toolshed. For the details on the Tarvol Pruning Saw, see the Product Reviews section. Here are a few tips to keep in mind when shopping for a pruning saw. If you’re interested in a pole-saw setup, you may want to take a look at these great pole saws for more information. The longer the blade, the more you’ll cut with each pull of the saw. Longer blades generally make for easier work, especially with larger limbs. But of course, longer blades make for more awkward portability and storage. Most hand saws are push cut, but pruning saws are typically designed for pull cuts. This means that pruning saws make their cut while you’re pulling the saw towards yourself, rather than pushing it away like a typical hand saw. This can be helpful when sawing at awkward angles, as you might in a garden. Just be aware of how you’re using your saw, as you can damage the saw if you’re not careful and pushing too hard. Some of the saws on our list fold for easy safe storage, while others do not. All things considered, a folding saw is usually advantageous compared to a non-folding saw, as that makes it easy to store. But the potential downside to folding designs is that you can push the button to fold it while in the middle of a cut, collapsing the blade, and frustrating yourself. Some find non-folding saws easier to work with, and prefer them to folding saws. Some of the saws on our list include sheaths, while others do not supply sheathes at all, and just offer a folding solution. Some allow buyers to purchase sheathes separately. Pruning saws are designed for outdoor use, primarily for cutting tree limbs or small brush. They are not intended for large tree cutting. They can facilitate care of ornamental or fruit trees or can be used in the woods to clear trails or to cut small limbs for campfires. Most models have the teeth set to cut on the pull rather than the push while applying the sawing motion. When using a pruning saw, it is a good idea to fit the saw to the job, and not to try to force a lightweight saw to do a heavyweight job. Trying to force the use of a lightweight saw in a situation better suited to a different tool can cause the tool to break. This section looks at five different pruning saws. We’ll start with a comparison table to get oriented, and then move into the individual reviews. We’ll conclude with our findings. The Corona saw is a handy size for working in a backyard or to take backpacking. It is designed for cutting small to medium sized branches and is perfect for trimming low-hanging branches or cutting up small limbs for a campfire. It’s great for creating kindling, but it’s probably not ideal for generating logs for the firewood log rack. 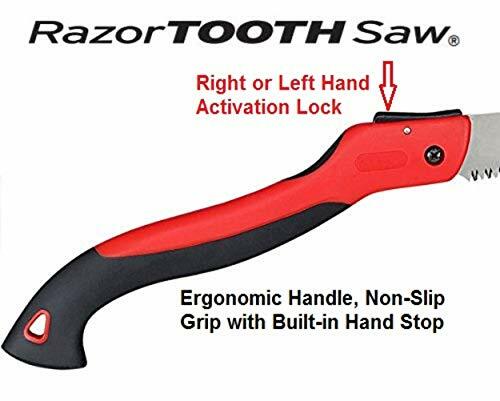 The handle folds to protect the teeth, as well as your hands and garments, when the saw is not in use. The brightly colored ergonomic handle not only makes it easy to use but also makes it easy to spot when lying on the ground. This is a light-weight saw in every sense of the word. It is not intended for heavy work, and trying to use it for heavy work will likely result in frustration, and a damaged saw. Over time it might need to be sharpened by a professional saw sharpener. It can be cleaned by wiping it down with a rag and a little fine oil. This is a handy saw for light use, such as pruning low hanging branches or cutting up small limbs. It is designed for use with green or dry wood. The Corona RazorTOOTH saw attractive and easy to use, although some users find that bends pretty easily, and that it grows dull rather quickly. Another common problem with these saws is that the bolt that holds the handle and blade assembly together gradually works off. If you run into this issue, a good solution is to replace the bolt with a heavier one of similar size that has a wingnut instead of a standard flat nut. The Tarvol Pruning Saw has a pleasing ergonomic design that feels good, and makes for efficient work. The pistol grip handle is a cheerful lime green and black, and provides a secure hold while cutting. Though the color choice on this one may make it more likely to get lost in the grass and branches than some of the other saws on our list. The teeth on the Tarvol are sharp and cut quickly through green wood, though of course the saw is primarily designed for pruning. The sheath, many users find, is difficult to remove from the blade and is too thin and flimsy to instill confidence. It is by far the least appealing part of this package. However, you could always just skip the cover and hang the saw up between uses. Just be careful with it; it’s sharp! The Tarvol saw does a good job of cutting, although some find that the blade is a bit light. With its folding handle, it is easy to hang off the side of a backpack or to add to general camping gear, so it’s ideal for camping. It is an excellent choice for the small orchard gardener who just needs an occasional trim of a small tree or bush. 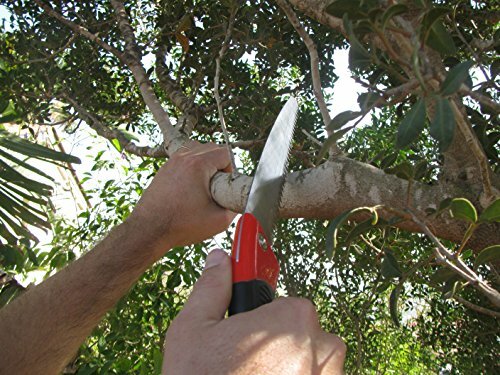 Even so, the Tarvol pruning saw does what it needs to do, which is to cut small to medium sized round limbs. The Tabor Tools TTS13 is a heavy duty saw designed to easily cut larger limbs, including limbs hardwood trees such as oak. It does not come with a sheath, and the blade does not fold. You can purchase a sheath separately. TABOR TOOLS Sheath for TTS13A Pruning Saw, Holster TTS13 13" Curved Saw. While not as handy to carry as some of the other blades, this blade is really great at cutting branches. It is almost universally praised, which is a rarity, given the strong opinions many users place on their tools. The Tabor Tools saw is an excellent tool for pruning, creating trails, and general tree trimming. It is a little bulkier than the other saws mentioned above, but has the advantage that it will not accidentally close up on you during use. Like the other tree saws, it cuts on the pull, not the push. The Tabor Tools pruning saw is an excellent tool, and the added protection and durability that comes from a sheath makes the additional sheath a wise add-on. Whether you are backpacking into a forest area or pruning your fruit trees at home, a broken saw can be a problem. The Tabor’s sturdy blade reduces the likelihood of the saw breaking. It is unequivocally an all-round excellent tool that is highly regarded by users. The Fiskars Pruning Pole Saw is a bit of a different beast than the other saws on our list, as it’s attached to a pole for easy extension. It’s obviously not as portable as the smaller hand tools on our list, but nonetheless, this pole saw will be a valuable asset to your tool repertoire. It can be used to trim branches that have grown to rub on the side or roof of your house or to thin out too-thick growth. If you only need a slender branch trimmed, the pruning cutter makes short work of branches and twigs that are too limber for the saw. The only caveat for this tool is that you should not try to force cut larger twigs with the lopper. This can cause it to break or to be twisted off true. This handy saw is an attractive bright yellow, which makes it easy to spot when it is laying on the lawn. It is a bit unwieldy for low, close cuts, but is perfect for reaching into a hedge or getting to those upper limbs. Help keep home DIY trimmers off ladders, which is always a good thing, given the significant chance of injury, especially using saws on a ladder. Fiskars are extremely well-regarded tool makers from Scandinavia. They make good tools, and the pole saw is no exception. This pole pruning saw doesn’t have a guard or anything fancy about it. It is just a good, useful tool that does its job well. The Silky Big Boy 2000 is a sturdy folding saw that is excellent for gardening or outdoor work. The blade folds for easy carrying, but a plastic sheath is also available for storage. There are a variety of Silky garden saws available through a variety of sellers. When purchasing one, it is advisable to make note of the original seller for warranty purposes. 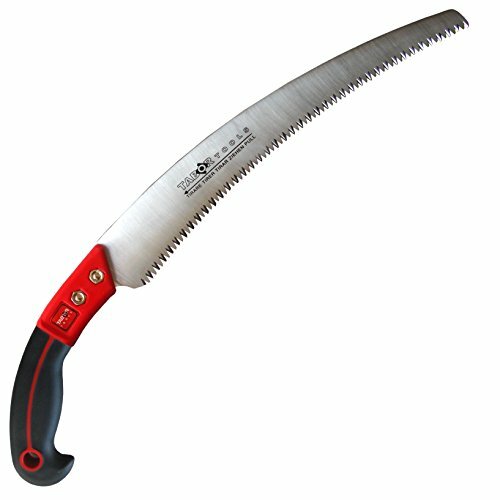 With that said, it is a well-known brand with a reputation for being an excellent saw for garden or outdoor use. The Silky Big Boy 2000 is A good saw with reliable pull-cut action. Users are advised to remember that it cuts on the pull, not the push. Trying to force a push cut could cause the saw to bind up, and the blade to break. Your choice of pruning saw is likely to depend on a lot of factors, including local availability, the frequency of use, and type of use. However, with that said, we found the TABOR TOOLS TTS13 Pruning Saw to be the best pruning saw around. It is intended for cutting medium to heavy limbs, so it is a little sturdier than the folding saws listed here. That means that if you plan to take it backpacking or camping you, are likely to want to purchase the sheath for it, even though that part is sold separately. 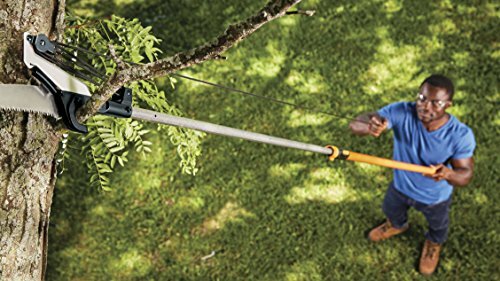 The Fiskars 393951-1001 Extendable Pole Saw & Pruner is an incredible tool for home tree care. It could easily be the number one choice except that the pole does reduce its portability and makes it a little cumbersome for close work. For privet hedges, small fruit trees or even deciduous shade trees, this is an excellent tool. The telescoping handle means that you can cut limbs that are a good way above your head without resorting to a ladder, the pull-cut action of the saw allows gravity to help with making the cuts. The Tarvol Heavy Duty Pruning Saw is a folding saw, and it is a little less expensive than the other two. It is a good choice for the budget-conscious gardener or camper who will not likely be using the pruning saw often, but who needs one on occasion. It is a little lighter-weight than the Tabor pruning saw and is only rated for light to medium branches. It comes with a sheath, which is an advantage for backpackers and campers, but unfortunately, the sheath is the worst part of the package.